Look back to those times when you could make a difference. Let's make it now. "She was perfect for me. Had she not been my first heartbreak, I would have loved her." You know when people say how we should do these amazing things in our 20’s. Travel the world? Rock Cleveland? Backpack through Europe? Live at concerts ? Because we have our 30’s and 40’s and the time eternity to plan our lives and go methodically towards everything,from everything. But see that is the thing. Since I have discovered things ( because let us face it,it takes a life to discover ourselves) , I know I want to travel. Why just the 20’s? Why only those times when I am active and spontaneous? Why not the 30’s? or any of the times when I am battered and beaten to pulp from the world and I just need to go somewhere where it is peaceful? Or when I want some rock and action and a beat to my life? To know how my life works in the best if times and the worst of times? Yes life is dedicated to this one person who makes me incandescently happy and the whole journey goes to finding that person. And I may even have that person and that makes me happy. But life is so much more. 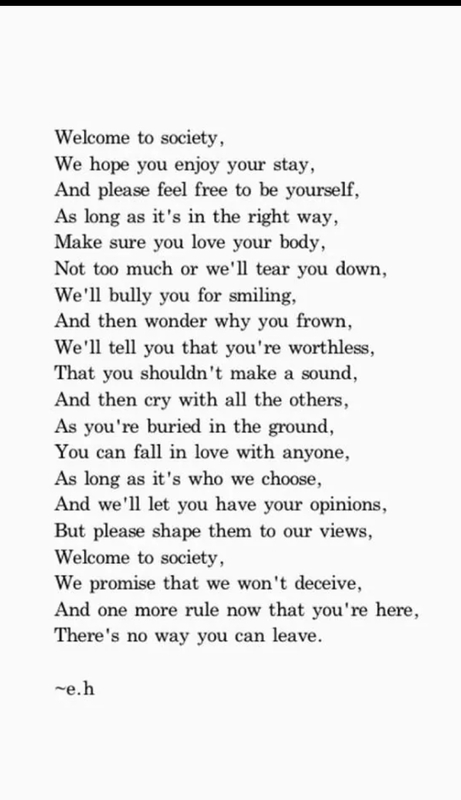 Why can we not fall in love with life,first? Fall in love with life, With yourself. I fell in love with travel way before I knew I did love it. You know how you just have to have to travel. And to you fearless readers out there,who maybe are there and maybe are not. Travel the world as the decades go in. Why stop? Planning the lives? People do that all the time! Here is my life out to you strangers. Look,No one wants the people they know to read their thoughts. Leverage is all anyone ever needs to succeed. but that is just sometimes. The other times consist of the brave. the ones who lose and do not cry. the ones who are so defeated that they may rise. the ones with irony,despair in every single drop of blood coursing through their veins. the ones who win,know how to live. the ones who don't are just learning to. Now there is where the fun is. I wasn't a bad kid,dad. And I prayed god to let me be. Don't you rub your wounds on salt! However wrong my death may be. It's a bad day. So what do you do ? Cry yourself to sleep sounds not do bad. Distract yourself is okay too. But what If you want something else ? Take deep breaths. As many as you need to calm those thudding heart beats. Remember a day that was close to being perfect? Remember the feeling? Yes,that one. Ofcourse you can relive it. It's how you've been surviving this long. You want to feel that way again. With me. Okay ? Okay. Keep the faith that YOU will be. Believe in the nothingness of something. 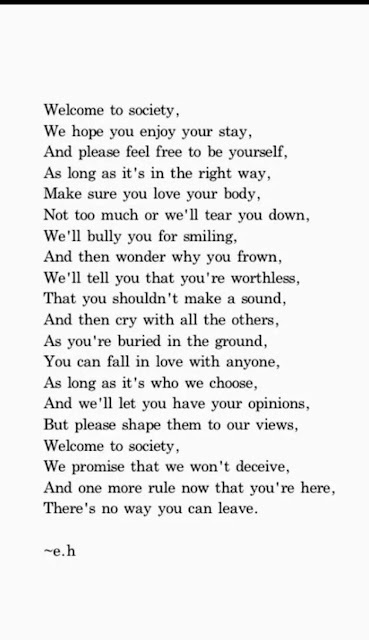 Welcome to Society and Have a Good day? What kind of man lays his hands on the women he loves? "You don't know what I've been through!" "You don't know what I've done for you!"